If I get this wrong Diane will correct me. And so Diane and I were driving up angling Creek Road, just north of Utopia, just north of where it joins the Sabinal River, looking for the place where the last Comanche captive was taken here in this area. this is going to be brief since I am still typing with one hand. when I was little, my dad (Billy Fisher, above) was always moving his cattle from one place to another looking for grass. this was during the drought of the ‘Fifties. So he had only us daughters to help him and we were driving cattle up this very road, to another place way on ahead, where the grass was still good. Us girls were all prepared to go to this Halloween party and we had our costumes made, we were so proud of them, and Dad wants us to help him move cattle! We figured we could get them moved and ride home in time to get on our costumes and go to the party. This was me and Joan. Betty was too little. 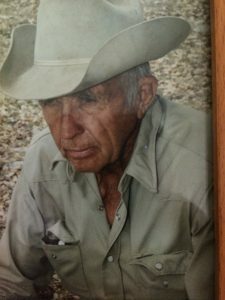 And right here (another road came in) — Dad used to like to work with half-broke horses and he was on this two-year old that was half crazy, and so right here it cut up and threw him, threw him into the rocks and he broke his arm. And so here are two girls and a herd of cattle and Dad with a broken arm and that two-year old horse running off. Finally some neighbors saw the horse and came in a car and got Dad to a doctor. I don’t even remember if we finally got to go to the Halloween party or not. Billy will be having his 95th (?) birthday at the nursing home this coming Wednesday and we are going to go sing and play for them. 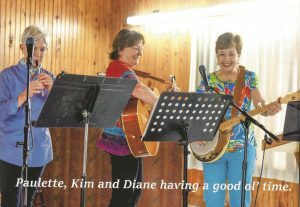 Here is me and Kim and Diane playing something….I forget what. I cherish friends like these. And now I have to go down to the corral and put up a windbreak mesh around the loafing shed rails. Big blow coming in tonight and I must get Billy and Buck up to shelter. Supposed to reach 80F today and down to 28F tonight, wind at 30 mph.